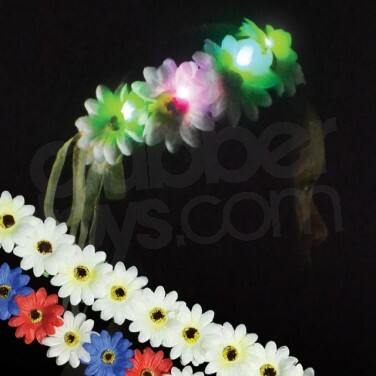 Finish off your look like the party princess that you are with a magical halo of daisies lit with LEDs! 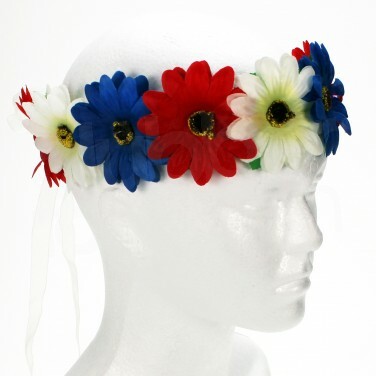 Nine over sized flowers form a beautiful daisy chain available in either all white or red, white and blue, each lit with a bright LED to create a stunning headband that's pure enchantment. A stunning garland that's ideal for most celebrations, this flower halo has a discreet battery pack that comes with batteries included. Flower Halo - White Accessorise with a delicate daisy chain of beautiful flowers lit with bright LEDs for an enchanting hippy vibe. Flower Halo - RWB Accessorise with a delicate daisy chain of beautiful flowers lit with bright LEDs for an enchanting hippy vibe.